KIEV, Ukraine -- A rights group wants European Union leaders to call attention to what it calls “endemic abuse” by Ukraine's police force at an upcoming summit. 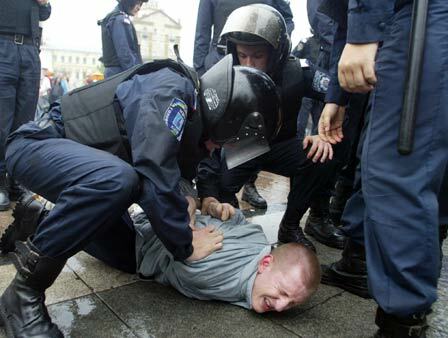 Riot police restraining demonstrator in Kiev. Amnesty International issued the plea Friday, ahead of a December 19 summit between the EU and Ukraine in Kiev. A recent report by the human rights group accused Ukrainian police of torture and of extorting money from victims. Tensions between the EU and Ukraine have been rising in recent weeks. On Tuesday, an EU official voiced “serious concern” to Ukrainian President Viktor Yanukovych about the jailing of opposition leader Yulia Tymoshenko. Ms. Tymoshenko was sentenced to seven years in jail last month for exceeding her power as prime minister when she signed a 2009 gas deal with Russia that her opponents say was too beneficial to Moscow. She has denied the charges and has appealed her conviction. The December 19 summit in Kiev was expected to focus on preliminary steps toward Ukraine's joining the 27-nation bloc. EU officials have warned the Tymoshenko trial is damaging Kiev's hopes of signing an association agreement by the end of this year, a key first step toward gaining EU membership. The United States, the European Union and human rights groups have condemned the charges against Ms. Tymoshenko as politically motivated.